Deepavali saw Chennai choking from toxic fumes. The city was smothered in a blanket of dense smog on Wednesday as Chennai recorded one of the highest levels of air pollution across India. 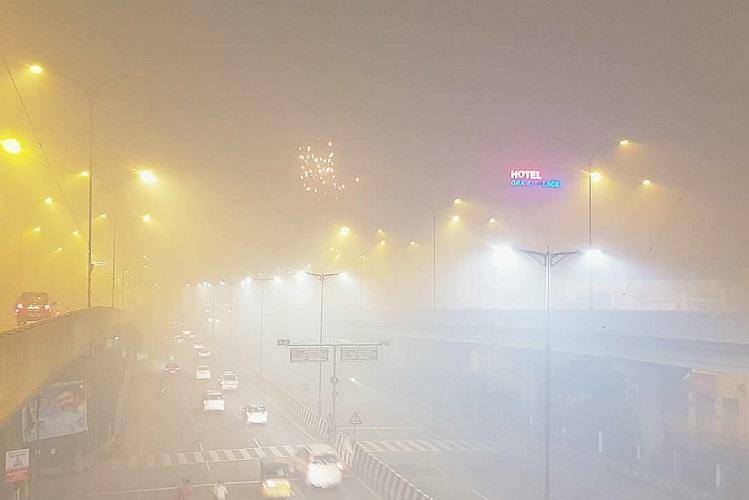 According to the Central Pollution Control Board’s (CPCB) data, the monitoring station at IIT recorded hazardous levels of particulate matter (PM) 2.5, hitting 936.69 μg/m3 between 11 and 11:59pm on Wednesday. CPCB’s monitoring station at Alandur touched a high of 837.78 μg/m3 between 9 and 9:59pm on Wednesday, while Manali in north Chennai, an industrial area, recorded a maximum PM 2.5 level of 999.99 μg/m3 for two hours between 12am and 1:59am on Thursday. Incidentally, as per India’s Air Quality Index, the permissible level for PM 2.5 is between 0 and 60 μg/m3. Anything above 250 μg/m3 is categorised as “severe”. The air pollutant in Chennai was, therefore, more than 15 times India’s permissible limit. But it’s not just CPCB’s air pollution data that is alarming*. A joint initiative to monitor air quality in Chennai by the Urban Sciences, Healthy Energy Initiative and Huma Lung Foundation also reveal that the spike in PM2.5 levels took place post 6pm on Wednesday. Their four monitoring stations are located in residential neighbourhoods like Besant Gardens in South Chennai and Anna Salai (Huma Lung Foundation) in Central Chennai and in industrial areas like North Chennai’s MKB Nagar, and Ennore. The huge spike in PM 2.5 levels on Wednesday evening is indicative of the bursting of firecrackers for Deepavali. Data shows that Besant Gardens – a residential neighbourhood with siginificant greenery – saw PM 2.5 level skyrocket to 1017 μg/m3 at 7pm. At the same time, Anna Salai recorded 557 μg/m3, Ennore 400 μg/m3 and MKB Nagar 199 μg/m3. By 9pm, while PM 2.5 levels marginally reduced to 786 μg/m3 (still severe) in Besant Gardens, Anna Salai peaked to 1055 μg/m3, MKB Nagar to 1172 μg/m3 and Ennore was at a very poor 205 μg/m3. But what is particulate matter 2.5 and how is it harmful? According to the United States Environmental Protection Agency, particulate matter 2.5 are “fine inhalable particles, with diameters that are generally 2.5 micrometers and smaller.” The source of PM 2.5 comes from vehicle exhausts, construction sites, anything that involves burning of fuel, wood, coal, oil etc and also from natural sources such forest fires, states the New York Department of Health. Inhaling PM2.5 can cause severe respiratory issues and worsen existing medical conditions such as asthma and heart disease. In the short term, the New York Health Department observes, exposure to PM 2.5 can cause irritation to the eyes, nose, throat and lungs, besides coughing, sneezing, running nose and shortness of breath. In the long term, inhaling fine particulate matter can cause chronic bronchitis, reduced lung function and increased mortality from lung cancer and heart disease. The most vulnerable are children, pregnant women and the elderly. But just why did Chennai witness such toxic levels of air this Deepavali? Environmentalist Nityanand Jayaraman argues that the question of the city’s air pollution levels falls within the purview of multiple agencies in the state – including the Health Department, Chennai Corporation and the Tamil Nadu Pollution Control Board. While he notes that awareness in the past has led to dip in firecracker consumption during Deepavali, there were no campaigns this year. “Awareness is closely linked to campaign. It needs to be reinforced. Several years ago, there was a firecracker dip and this coincided with government and NGO campaigns. This year there was nothing and that’s why there was a complete spike in air pollution,” says Nityanand. *The reason for varying air pollution data from CPCB and the joint initiative is because the locations of the monitoring stations are different. Moreover, data varies also based on the monitoring equipment used.